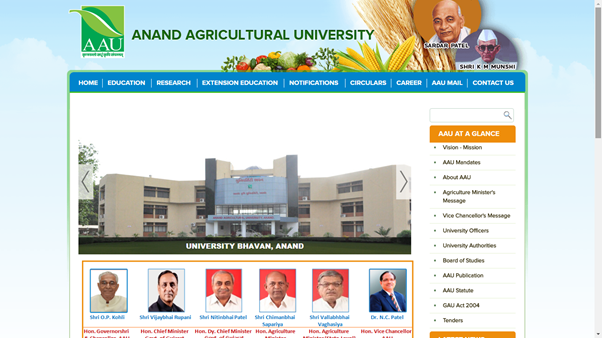 ITC has prepared a Web Site for Anand Agricultural University; This web site includes various aspects and activities of Anand Agricultural University like administration, faculties, colleges, education, and extension, e-library, tender, Right to Information Act etc. The website has dynamic uploading for all the colleges, extension centers, research centers, etc. The dynamic updation of the site from the concern end user is under admin approval process. 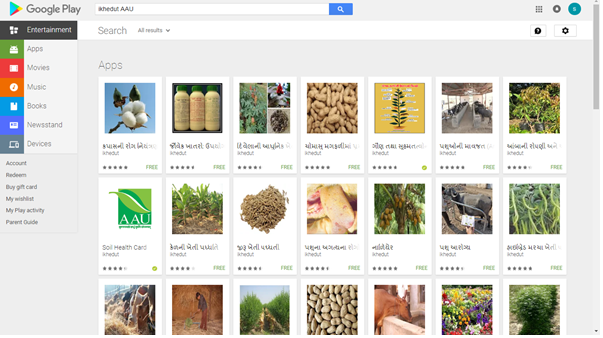 Furthermore this website has some pages in regional language (i.e Gujarati) so that farmers of Gujarat can get benefit from that. Improved Soil Health Card Portal has been handled by Information Technology Center, AAU Anand.–The Soil Health Card System contains agricultural information of all districts of Gujarat which is used for the benefit of farmers, agricultural scientists and decision makers.It is an only one of its kind information project prepared and initiated by the Government of Gujarat for the benefit of farmers at the grass-root level.–This, promote scientific agricultural technologies by enabling the farmers to get required specific information through use of Information Technology. This program is projected to link the distance between Scientist – Extensionist – Farmers and Input- Output Dealers effectively. 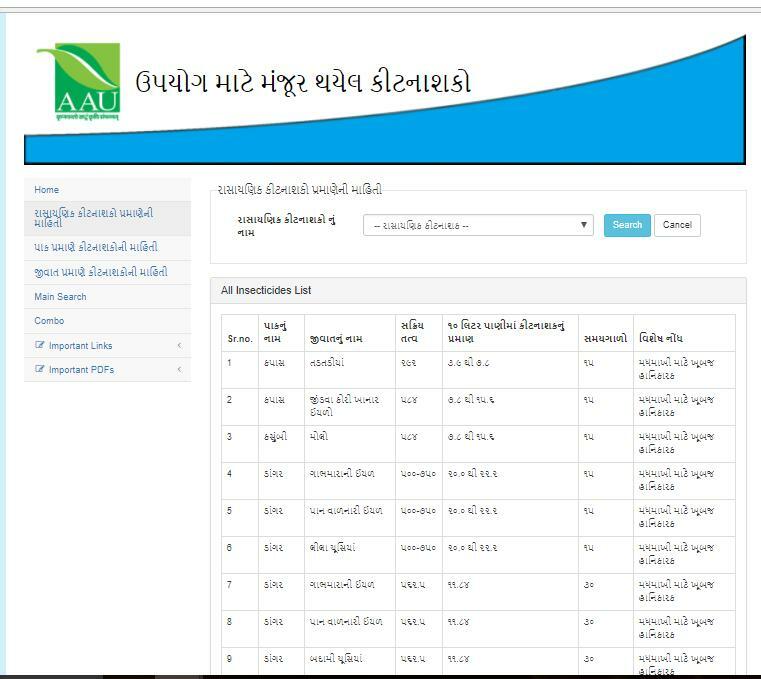 Improved and technically efficient online data entry programme for the Soil Health Card System has been handled by Information Technology Center, AAU Anand. Also provided Training to the different kind of users of Soil Health Card project at Gandhinagar, which demonstrates the flow and how to use the Data Entry Module. ખેતી માર્ગદર્શન પત્રિકા દ્વારા ખેડૂત પોતાની જમીનનું જમીન આરોગ્ય પત્રક ઓનલાઈન જોઈ શકે છે તેમજ ડાઉનલોડ પણ કરી શકે છે. જમીન આરોગ્ય પત્રક ઓનલાઈન જોવા માટે ખેડૂતે પોતાનો જીલ્લો , તાલુકો અને ગામ સિલેક્ટ કરી અને પોતાનું નામ સિલેક્ટ કરી શોધો બટન પર ક્લિક કરવું. For UG, PG as well as polytechnic programmes, Anand Agricultural University (AAU), Anand has given common admission to colleges of all agriculture universities in Gujarat. Students wanting to shape their career in agriculture sector will be able to apply for admissions online at colleges managed by Junagadh Agricultural University ,Navsari Agricultural University, Sardarkrushinagar Dantiwada Agricultural University, Kamdhenu University – Amreli apart from AAU. 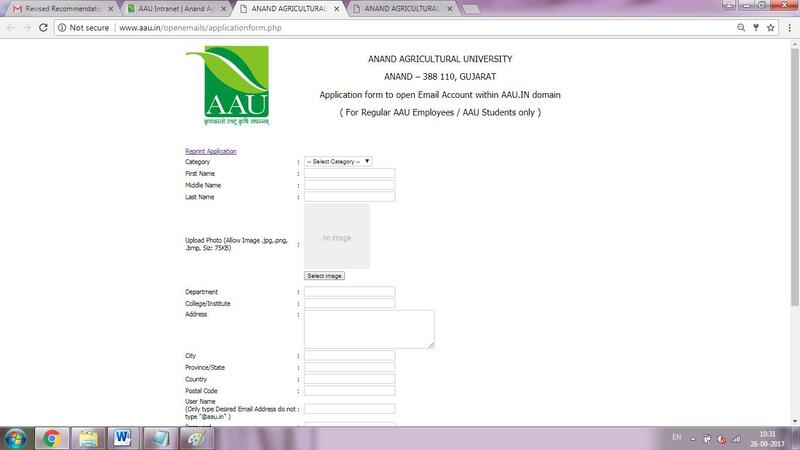 All the faculty members as well as students of our university are able to open new email account with auu.in domain i.e Gmail accounts of google provider. It is providing unlimited storage space for the individual without any cost. Click here to open new account. Online tour program will manage the entire tour program and its schedule for state agricultural university. It will store and display all the available information of each tour program.This web based user interface includes all the activities like starting from create tour program to recommendation from authorized user. The agricultural technology development and dissemination has crucial role to play for the development of the Agriculture sector as well as its beneficiaries like farmers, scientist and extortion functionaries.This portal provides the online gateway for the large access to the farmer as well as scientific community, for their knowledge enhancement/dissemination and/or research/extension improvements.The activities like FLD, Research Demonstration, on the field discussions/demonstration about new/existing schemes/research/real time problems or queries of the farmers can be recorded via tablet pc based web application which comprises the GPS feature and the said recorded audio/video can be placed on the centralized servers. 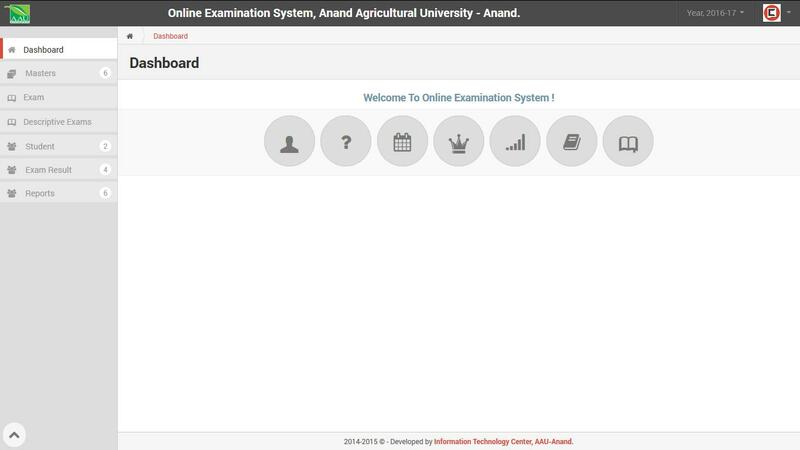 Anand Agricultural University has successfully implemented the online recruitment process for General / Schedule Tribe (Backlog) categories for class – II and above cadre and in different disciplines. ખેડૂત, કૃષિ અને પશુપાલન વિષયક માર્ગદર્શન મેળવી શકે છે. ખેડૂત વિવિધ ધાન્ય પાકો, તેલીબીયા પાકો, કઠોળ પાકો, શાકભાજી પાકો, ઔષધિય પાકો, મરીમસાલાં પાકો, ઘાસચારાના પાકો, ફુલછોડ પાકો વિશે માહિતી મેળવી શકે છે. તથા વૈજ્ઞાનિક ખેતી પધ્ધતિ, ખેતીમાં ગુણવત્તા, પશુ પાલન વિગીરે ની માહિતી પણ મેળવી શકે છે. ખેડૂત વિવિધ ધાન્ય પાકો, તેલીબીયા પાકો, કઠોળ પાકો, શાકભાજી પાકો, ઔષધિય પાકો, મરીમસાલાં પાકો, ઘાસચારાના પાકો, ફુલછોડ પાકો તથા વૈજ્ઞાનિક ખેતી પધ્ધતિ, ખેતીમાં ગુણવત્તા, પશુ પાલન વિગીરે ને લગતા/મૂંઝવતા પ્રશ્નોના જવાબ મેળવી શકે છે. ખેડૂત વિવિધ ધાન્ય પાકો, તેલીબીયા પાકો, કઠોળ પાકો, શાકભાજી પાકો, ઔષધિય પાકો, મરીમસાલાં પાકો, ઘાસચારાના પાકો, ફુલછોડ પાકો તથા વૈજ્ઞાનિક ખેતી પધ્ધતિ, ખેતીમાં ગુણવત્તા, પશુ પાલન વિગીરે ને લગતા/મૂંઝવતા પ્રશ્ન નો મુખ્ય તથા ગૌણ વિષય જણાવીને પોતાનો પ્રશ્ન પૂછી શકે છે. 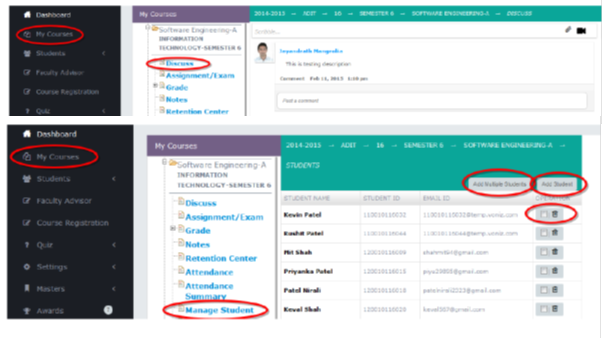 Using this web based user interface faculty members or Admin will create exam/s as per their requirement like number of questions, exam time duration, date of exam etc. Admin can add question online and also upload questions through the excel file and also upload images for any questions if required. Admin will also be able to select the students who will attempt the exam. Student can view their exam and appear for it. When student submit the exam result will be generated automatically using which the student can know his/her potential and how much more effort he/she needs to put in to get better marks. 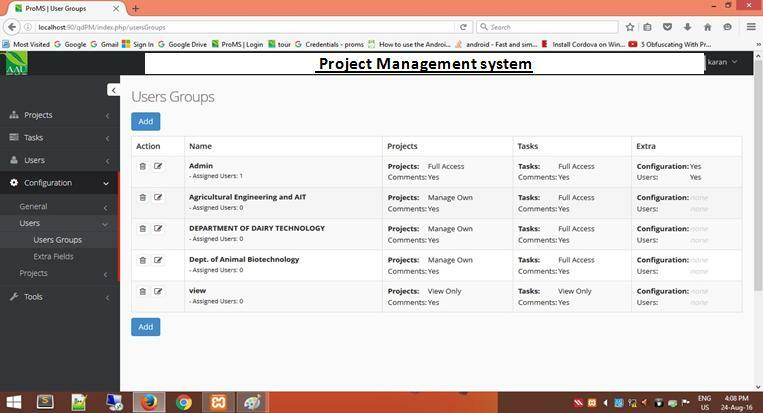 Using this system user can add new project as well as manage the created projects. User can also create multiple construction phases as per project requirement. They can also add the project details like different date, project amount etc. There are different actions included like Approval of project, project grant. This system handles the different financial transaction of our university and maintains the expenditure details. The system user (Accountant) enters all required details like scheme entry, grant allocation, etc. It will also manage the different kind of bills and react to them. 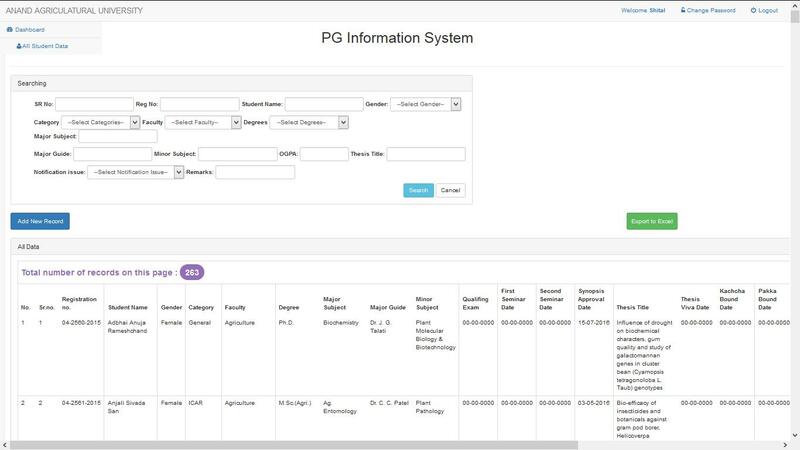 This system gives financial report of University. The System user (accountant) enters all scheme entry and grant allocation unit wise. Unit wise account officer user enters pay allowances and contingency. System user (accountant) can check bill and pass bill and can also see various report. Admin can generate various report as well as they able to print and export to excel also. Today, different organizations employ various management techniques to carry out the efficient functioning of their departments. 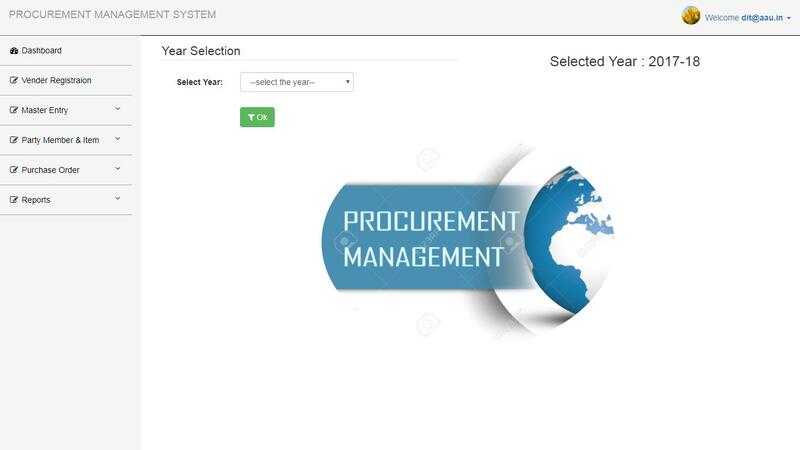 The Procure Management System contains the organization structure which that supports, automates and standardizes all stages of the indirect purchasing and procurement cycle - from requisitioning to paying vendors. Workflow automates the transfer process from requisition to purchase, eliminating manual intervention and to monitor discrepancies between ordered quantities and/or invoices amounts. The procurement is carried out and the planning of the process that will ensure the things run smoothly. Main Purpose of this project is to reduce paper work and time. With the help of this project we fetch all records within a single click to view appropriate records. We give multiple searching facilities to filter the records. We store all the records of the PG students. After storing every information of all student we retrieve particular records and download its Excel file. Nowadays in the world of digital environment we have to also move our steps by adopting new technologies. 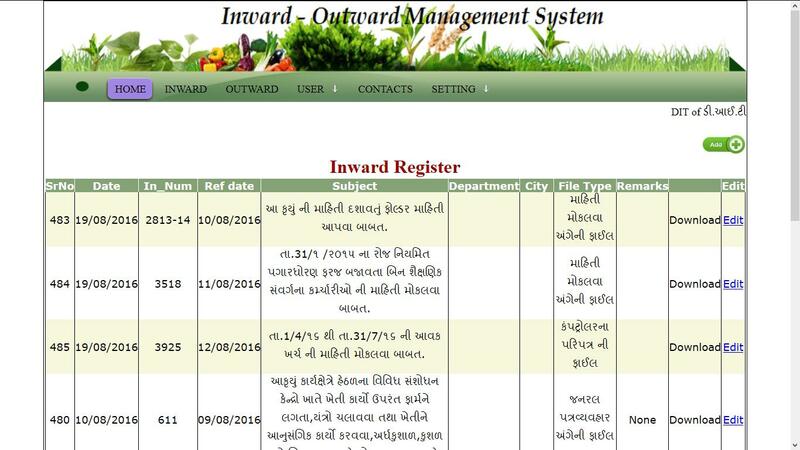 As, we all know at Anand agriculture university has many departments, all are managing inward and outward register at their offices manually. This system helps to manage all this details online and when and where needed we can search and download the details at any time. The Workflow/Organization Model contains the organization structure which includes the hierarchy of people in the department, their roles, reporting relations, the subjects they deal with and the sections they belong to. Document Management System tracks the life cycle of a document and facilities automated versioning and maintenance of documents. The Knowledge Management System consists of a repository of various documents which could be searched on the basis of its name, description, publish date, etc. Livestock Research Station, Anand is entrusted the responsibility of establishing a crossbred dairy herd which can thrive and produce good amount of milk in middle Gujarat Agro-Climatic zone. Research has also been taken-up to study various aspects of management, production, reproduction, nutrition, adaptation and economics of milk and animal production since 1979. 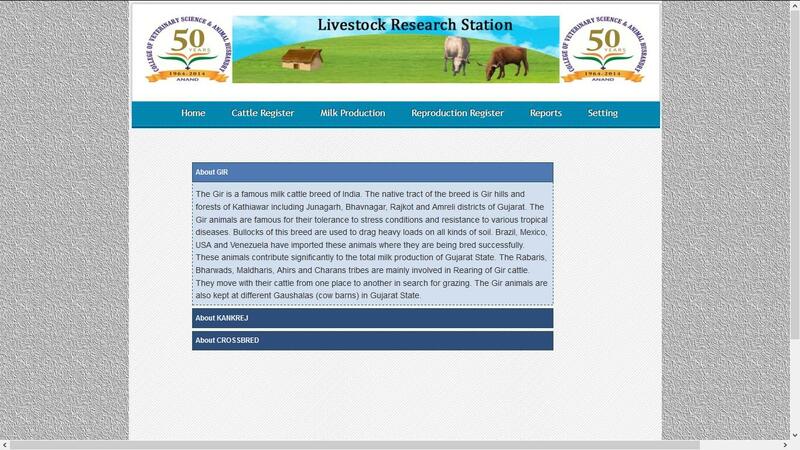 This system will store the details of Gir, Kankrej and Crossbreed cows and also assess the production performance of these different breeds. It will also helpful to find out the parental information of any cow. To identify the livestock problems of the area and plan the research strategy as a corrective measures for particular problem. Capacity building programme will facilitate the online management of all training programmes sponsored by Anand Agricultural University. It will also include, course director, to perform all the activities related to training programme starting from proposal submission to report submission. 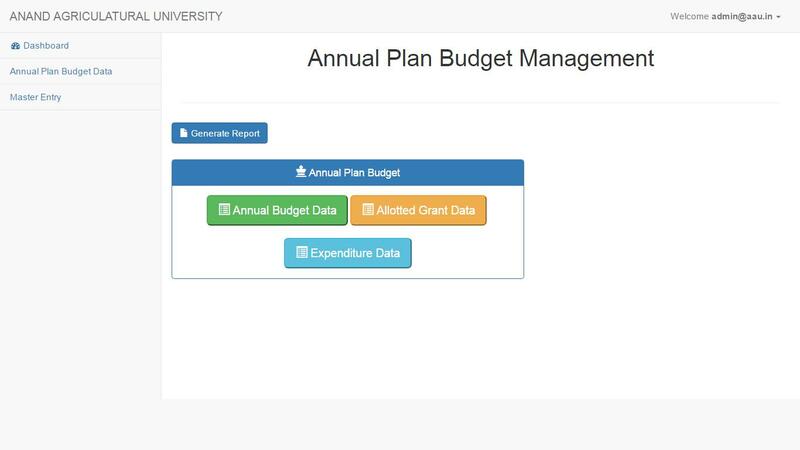 The Budget Management System enables state agricultural universities to manage the annual budgeting and funding process. System will adapt to a variety of budgeting procedures and will be powerful enough to replace traditional methods of manual record keeping system. 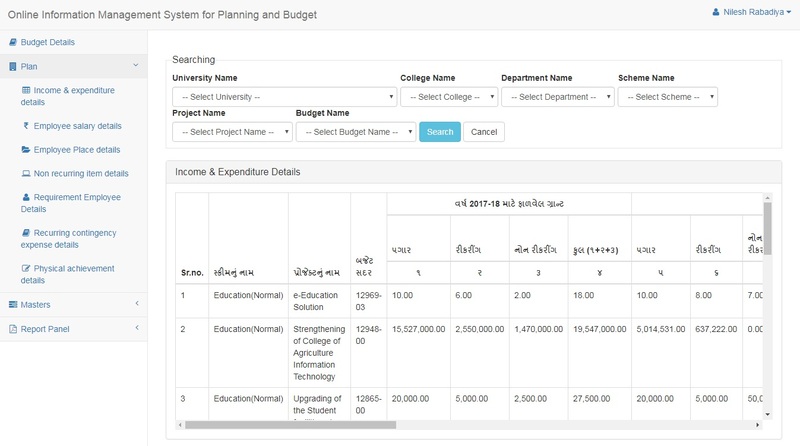 System will notify the percentage of expenditure, used/remaining for the university, scheme and budget wise. This online application is designed to be flexible with many user-based options. 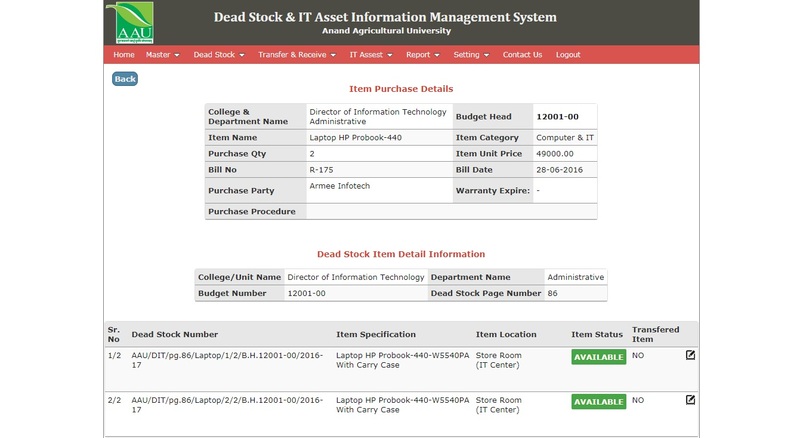 Every colleges and units of AAU purchased the dead stock items under multiple budget heads and keep their related entry in the dead stock register. It is difficult and time consuming process to find out the information from these dead stock registers. Furthermore every unit also purchase and install the IT related equipment’s and software’s as per need and recorded in register. If we store these registers information in database, we can easily and quickly retrieve information in the desired format when require. Online System enables to manage various extension education activities by the different extension education centers of AAU. For each extension activity system enables to store and manage the details of participants. System will also manage information regarding FLD programmes, on farm trial performed and budget information of centers. This online application will be flexible with many user-based options. 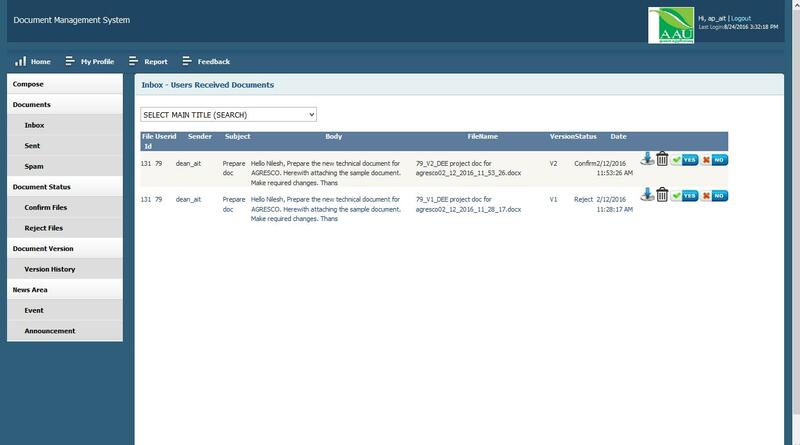 By developing this website the work of Admin, Student and Teacher make Easier and faster .This page allows Teacher, Student and Admin to enter into the Student Project Progress Information Management System. In This Project Students we can assign teachers for different projects. 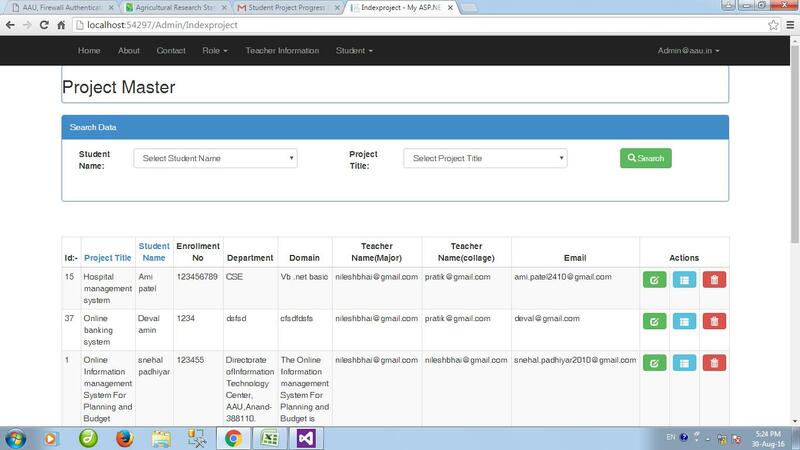 Student can insert their project progress details. Teacher and admin can generate different repots. Teacher show all information and they have some doubt then they could comment at particular student Project at a time. Teacher could see only their information which is allocated to him/her. The time consuming problem would be solved by developing this website. Today, different organizations employee various management techniques to carry out the efficient functioning of their departments. The online information management for planning and budget is providing the information for Year Wise Budget, Plan Scheme data. This system contains the pay allowance, recurring, non-recurring, construction data under the budget module and salary details of employee, Income and Expenditure, nonrecurring item, salary plan details. The online information management for planning and budget is carried out and the planning of the process that will ensure the things run smoothly. Pesticide is one of the important inputs in agriculture to safe guard the crop from insect-pests. Plant protection chemicals; insecticides, fungicides, herbicides, plant growth regulators and bio-pesticides are all referred as PESTICIDE. In order to reduce the risk of pesticide related contamination in food commodities, judicious use of these chemicals is mandatory. Farmers are required to be educated for safe and effective use of the pesticide in Gujarati language. Of the total pesticides used in India, Insecticide contributes more than 60% and therefore the present attempt is made to develop user friendly system for insecticides and later the other chemicals e.g., fungicides, herbicides, PGR and bio-pesticides will be added. Girl students’ safety has become the utmost priority of the educational institute/university considering the increasing cases of crime/harassment. There are various safety apps at present available in the market. This app will be designed keeping in mind the concept of personal safety of girl students of Gujarat State Agricultural Universities. It incorporates the essential features such as GPS tracking, emergency contact numbers. This system will provide the automatic alerts to the list of emergency contacts and transmission of GPS-determined location with just a tap of a button. Project management information system (PMIS) can be a framework to guide the progress of a project and help to increase its success rate. It brings accurate and relevant information to management within the required time frame, and helps to speed up the decision-making process and any action necessary to ensure that the project is on track in terms of time, budget and objectives. It is a framework or an initiative that measures the success rate of a project and provides necessary information for monitoring and controlling the project. Student corner is providing a platform for student as well faculty member to interact with each other. Faculty member can upload lecture notes, eBook’s, assignments, software/s, old papers, and videos for the assigned subjects and students can download it any time they required. Faculty member can also take online attendance and prepare the result and grade sheet. 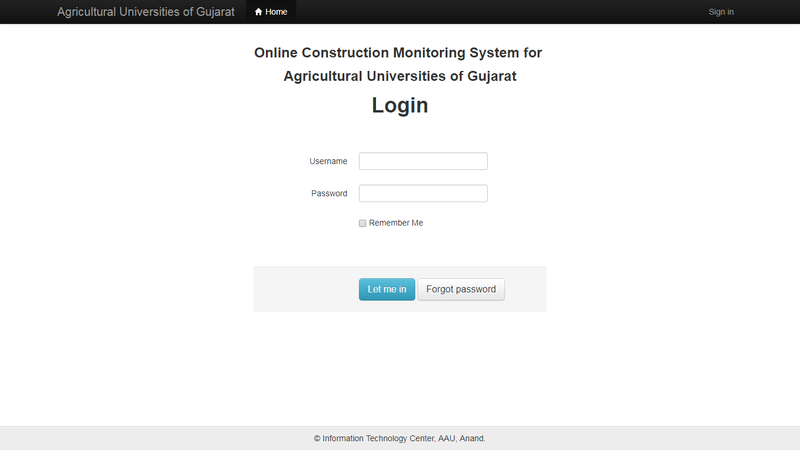 AAU employees and students of Anand Agricultural University campus can open firewall account for internet access. 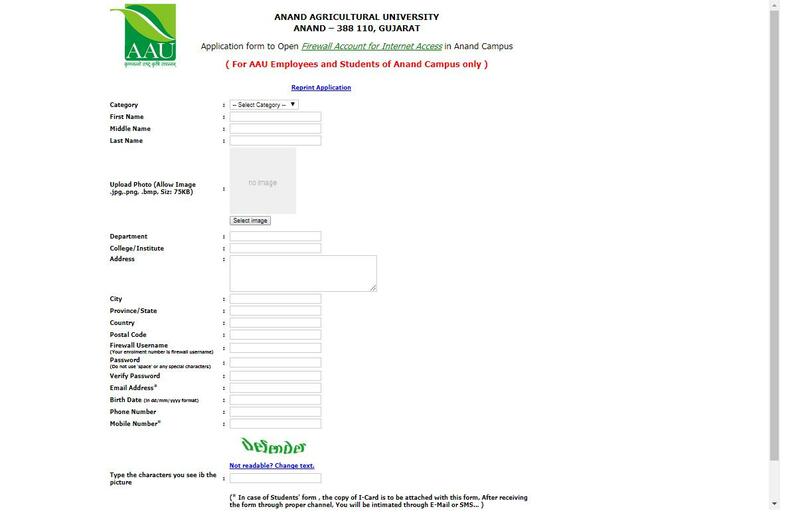 AAU regular employees and students of Anand Agricultural University can open email account within aau.in domain. This domain provides unlimited space on drive to store the data. E-Mentoring System is a high impact comprehensive learning solution to impart employability skills to upgrade student career prospects both for employment and higher education. It helps students to be job-ready through self-learnable programmes and online mentor interaction. Programmes are well researched, meticulously developed and continuously updated.